We entered Ecuador from Colombia in the early morning of Monday 29 October and could not believe how cheap the diesel suddenly was! We continued to Quito, the capitol, arriving mid afternoon and went straight to a travel agency to ask for last minute tour to the Galapagos Islands. We were lucky, there was a very nice boat leaving on an 8-day trip the next day, so we immediately booked it, got the plane tickets and arranged a night at the Marriott Hotel with our points so we had a safe place to leave Frida. 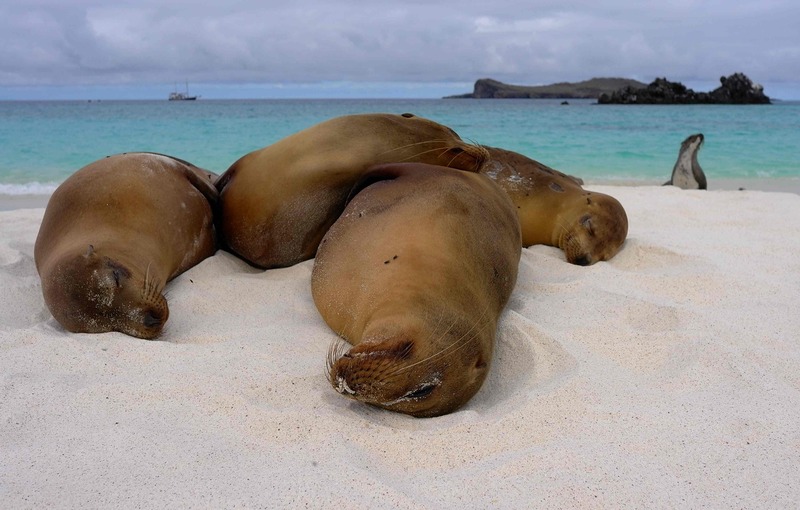 Fantastic, we were going to the Galapagos Islands! But first we had more work to do. We would like to climb some of the beautiful volcanoes of Ecuador and the travel agent had given us the phone number of a guide, Diego. We met him the same night and agreed a tentative climbing programme for after the Galapagos. Ecuador was already looking very good! The next morning we leaned back in the seats of the airplane and got ready for 8 days of relaxation, being part of an organized tour with accommodation, meals and tours all arranged and taken care of! And it turned out to be one of the best experiences we have had on our trip so far. First of all, the boat was fantastic. 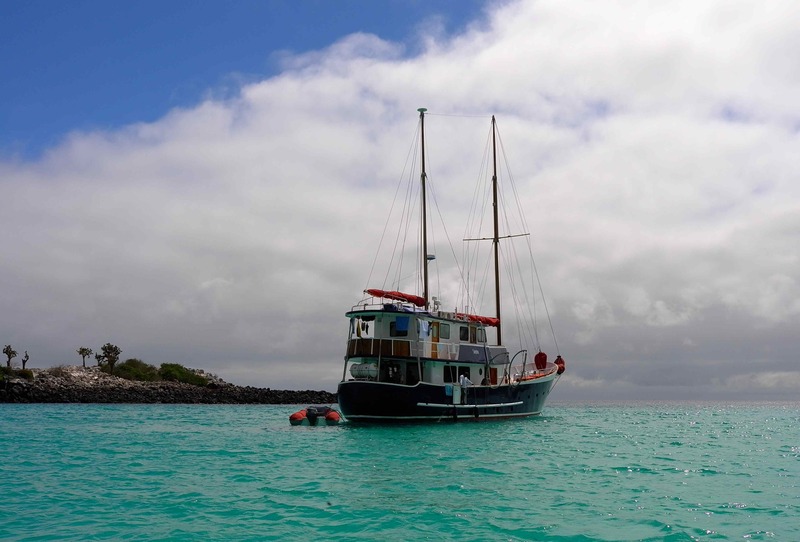 M/S Samba was built in Holland in 1963 and carefully refurbished in 2006 retaining all its charm. The cabins are spacious with private toilet and shower and there is lots of common space in the dining area with a large library of Galapagos related books and on the downstairs and upstairs wooden deck. The crew was brilliant, very professional, and always helpful and keeping the boat in tip-top condition. The food was plentiful and delicious. We had dessert both at lunchtime and at dinnertime! And every time we came back on the boat from an excursion there was some kind of snack, hot chocolate or fresh juice. We enjoyed! 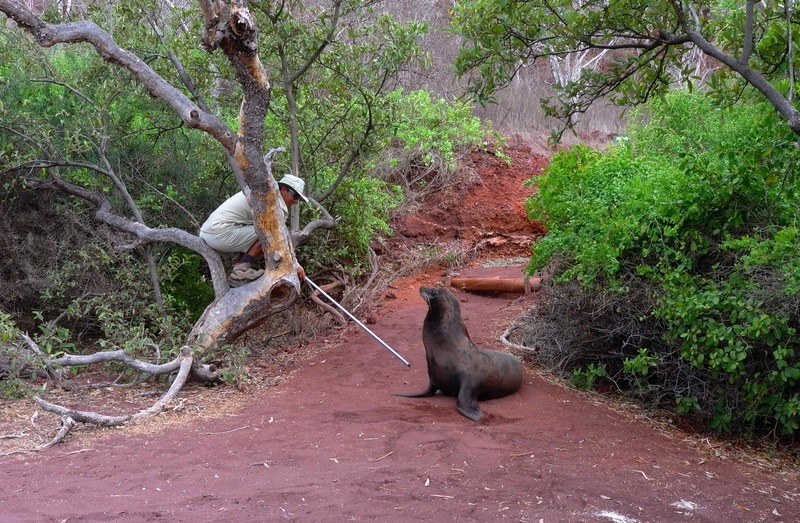 Our naturalist guide, Fausto knew everthing about the fauna, the flora, the landscape – and Malene was even satisfied with his geological explanations! Fausto had a very busy week updating us on the schedule of the day (wet landing, good shoes, bring your sticks), leading us on tours of the islands, telling about the animals, the flowers, the cactuses, the lava formations, answering all our more or less intelligent questions and trying to keep us from stepping on the iguana nests or walking too close to the large male sea lions. Or keeping Marco from breaking the rocks, Marco!!! We had a brilliant time with Fausto. Our favourite animals were the sea lions. They would be there sleeping on the white sand beaches, not at all bothered by our presence and only Fausto would keep us from getting toooooo close. They were snoring, growling, turning, bumping into each other, sighing deeply and messing around a bit, very very sleepy and absolutely sweet. 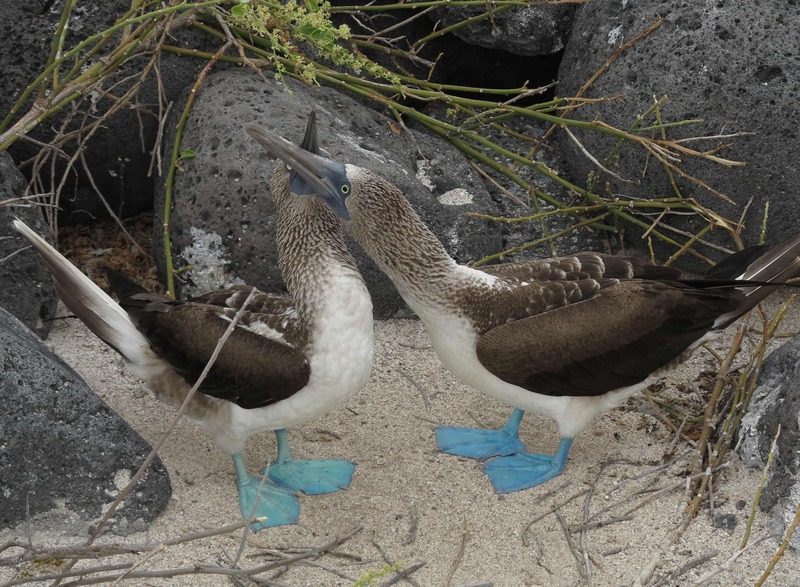 Second came the blue-footed boobies. They were incredible birds, again not at all scared by humans, standing there with their bright blue feet and looking at us with inquisitive eyes or diving like arrows into the sea for fish. And not to forget the albatrosses, beautiful birds, we sat on the edge of the cliffs and watched them cruising by on their large wings. They mate for life and keep up a careful ritual of mutual recognition with their mate. We also ran into a couple of albatross babies, they were large like turkeys! Then there were the iguanas. 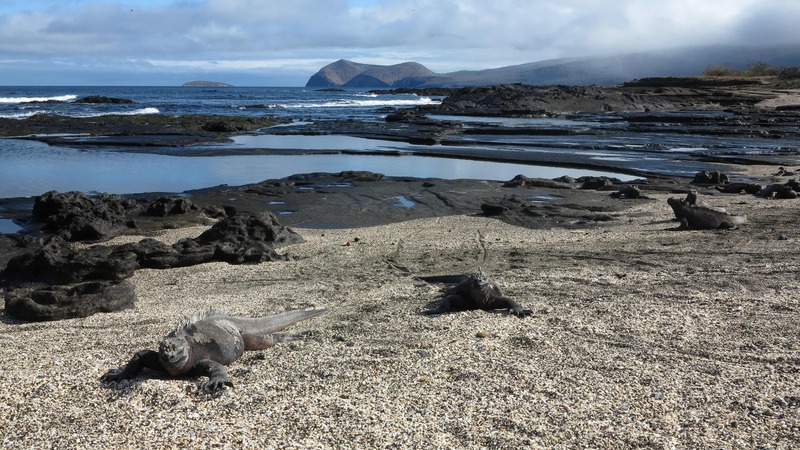 The marine iguanas especially were everywhere and sometimes we would almost step on them…well actually it did happen that one of us stepped on the tail of one by accident, they were in such good camouflage against the dark volcanic rock! The land iguanas were in the mating season and on one island the males had turned a beautiful yellow to attract the females. There were dozens of other amazing animals; the giant land tortoises, the small and shy fur seals (they used to be hunted by humans) and lots of interesting birds that we could get to watch up close. It was simply fantastic. Apart from our visits to the islands, we would go snorkeling every day, usually for an hour before lunch – and then we would come back to a steaming hot soup! We saw loads of colourful fish, sea urchins, sea stars, large sting rays and lots of sharks – a bit scary but Fausto claimed they were harmless! The highlight was always when we met a young playful sea lion; they would swim around us, after us and under us, and they would come so close that we could reach out and touch them. Obviously they were wondering what these clumsy dumb animals were doing in the water! Or we would surprise one of the big sea turtles grazing on the sea floor and she would set off swimming with her big flappy legs, but no faster than it was possible to swim along with it and enjoy the fantastic sight. We fully enjoyed the 8-day cruise and returned to Quito dreaming about dancing blue-footed boobies and snoring sea lions on the beach.